Here at Brides Up North we are dedicated to helping to inspire, excite and assist you, our lovely readers, on your wedding planning journeys, arming you with all the necessary information to make the process more straightforward, and above all, enjoyable! As such, we often call upon our trusted Sponsors, who are experts in their fields, to share their top advice, tips and pointers that will keep you right along the way. 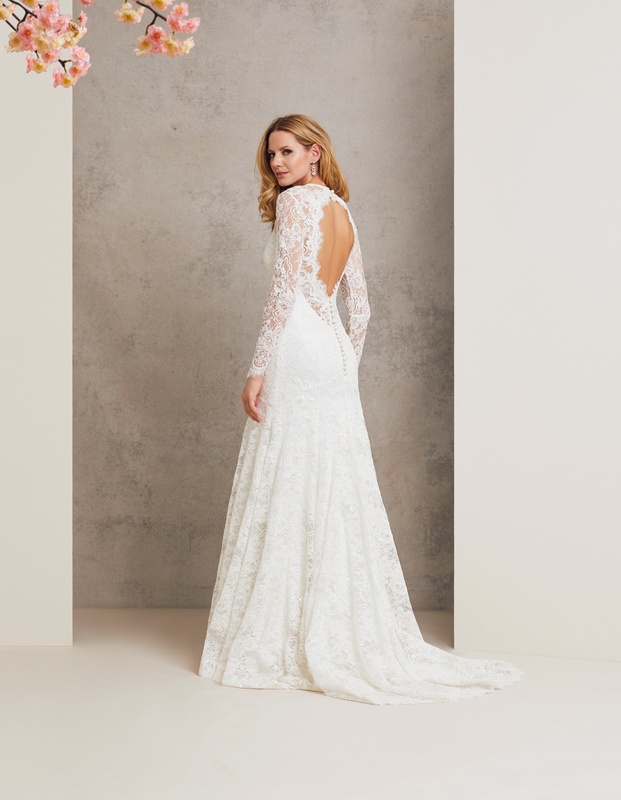 And today it’s the turn of top British bridal designer Caroline Castigliano to take to the blog with some fabulous words of wisdom for you ladies currently on the dream dress hunt. As one of UK’s leading bridal designers, Caroline has been realising brides’ dreams for 27 years and has built up a glowing reputation for her incredibly beautiful designs with clever corsetry that shows of the female figure at its best. We caught up with her as she prepared to fly off to New York Bridal Week to discuss how brides should best dress for their body shape. Ladies, you may well want to grab a notebook as this information is golden! Images provided by Caroline Castigliano. caroline says: Once you have booked the venue, and have seen the room where you are going to have your wedding breakfast, you have seen the dance floor, you just want to think about that moment. When you leave the table and walk towards the dance floor with your now husband how is it that they want everyone to see you. You don’t need to know the shape of the dress, if you are working with an expert they will find the silhouette for you. What you need to know is what that dress is saying to people – is it saying a very strong traditional look, soft and romantic, elegant and classic, vintage, boho. What is the appeal of the dress? Without considering the silhouette decide on the vision – once this has been determined – go see one of our fantastic stockists and you will get advice. It is important to work with someone that understands silhouettes and fabrics so they can show you what suits you and what creates a strong silhouette for you. 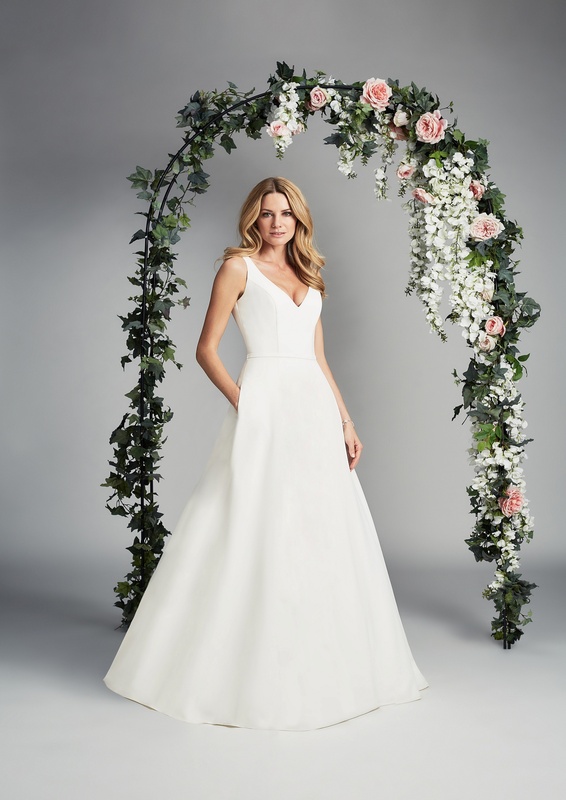 If you are 5ft you will suit totally different silhouettes to someone that is 5’8” tall – if you are full busted you will suit different silhouettes to a bride that is more petite. Once you get going it is all quite easy but it starts with that one all important question – what vision do I want my future husband and my guests to see when I arrive at the wedding? Corsets are the engineering of our gowns, they are the foundation that everything is built around – each panel is hand cut to mould and sculpt the figure. They also have a very flattering effect on the bride’s figure, I design the corsets to really balance the figure and extenuate a small waist. I have a number of different corsets that create different effects depending on the design of the gown, nothing will ever compare to a beautifully structured corset creating the foundation of the gown. We have also developed a unique stretch corset that is to die for so while you are getting the beautiful balance you also get great comfort. What elements can help to improve a bride’s posture, stance and confidence? 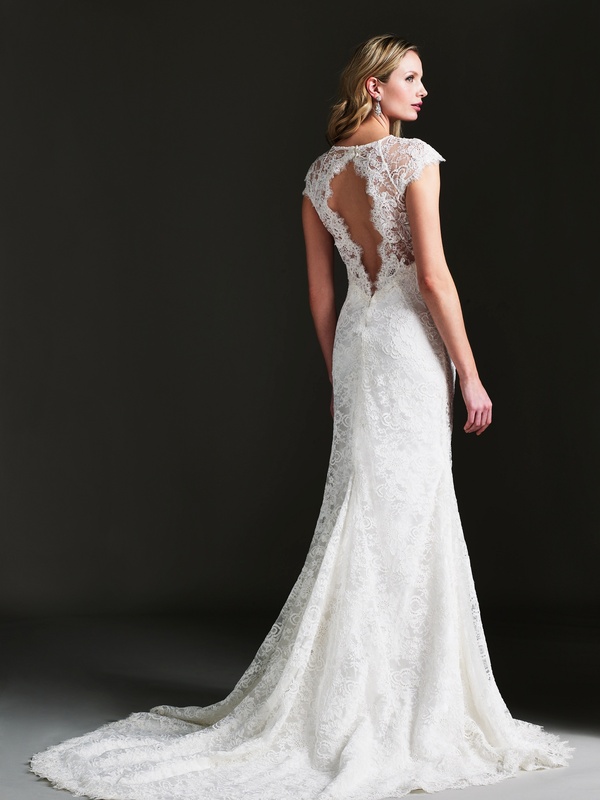 Brides who have a straight body shape will find they have a less defined waist than most. Your bust and hips tend to be pretty balanced and you are not as curvy. 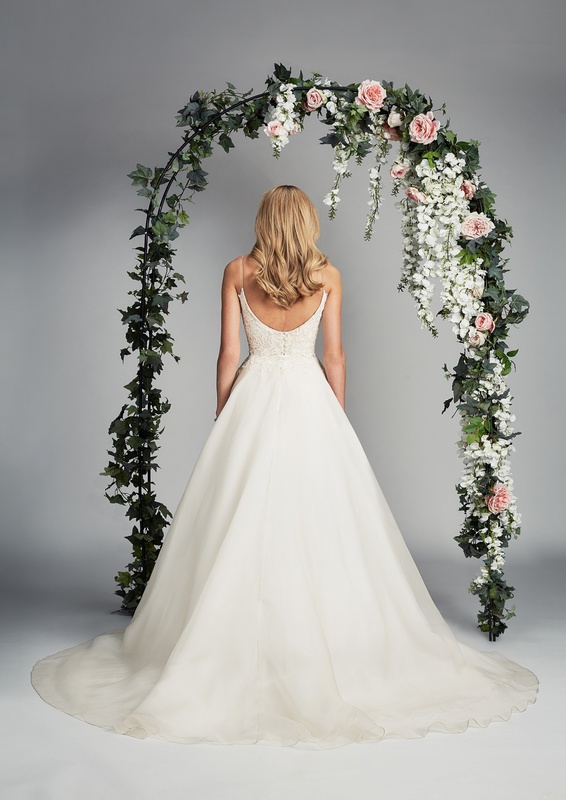 This is known as more of a ‘sporty’ athletic body shape, and it is important, when picking a bridal gown for a straight structure, to enhance your waistline and create a soft curve on the bust. Look for: Bridal gowns with full skirts give the illusion that the hips are wider than they will add a feminine shape to you. Look for embellishment around the bust and necklines it is also good to have an off-the-shoulder strap as this draws the eye to the width of the shoulder and then gives the illusion that the figure is more curved as the eye leaves the shoulder to a small waist. 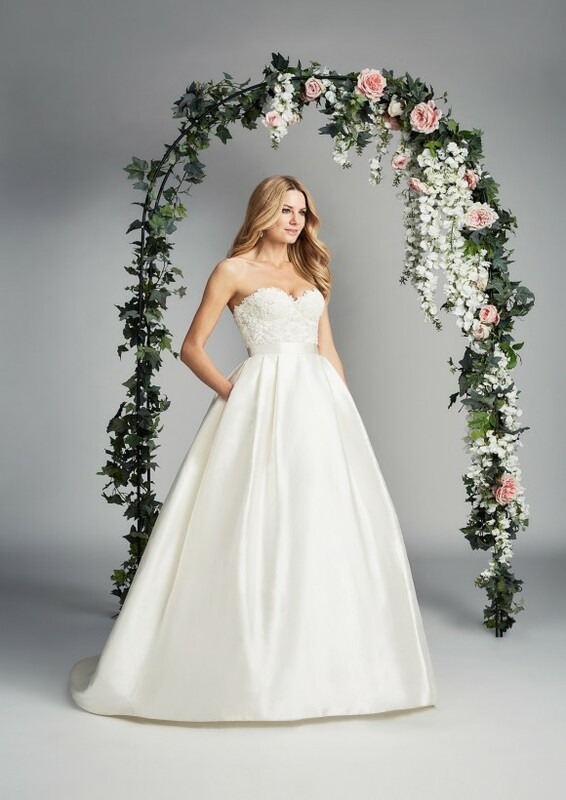 Avoid: Strapless dresses can make your shoulders look broader than they are so avoid harsh necklines and column wedding dresses that have no definition in their shape as they won’t give you a defined waist. Look for: For a pear-shaped body choose a ball gown. A waisted dress and full skirt accentuates the waist. These gowns will still show off your waistline and really flatter your body type. 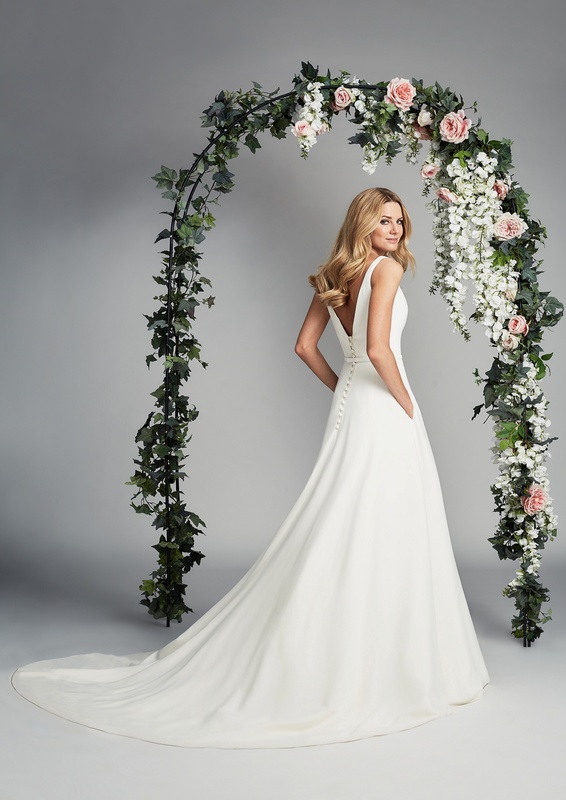 A pear shape bride wants to really emphasise the top of the body, beautiful arms, lovely bust shaping and small waist – a corset will always redefine your figure and create a perfect balance between your bust and waist. 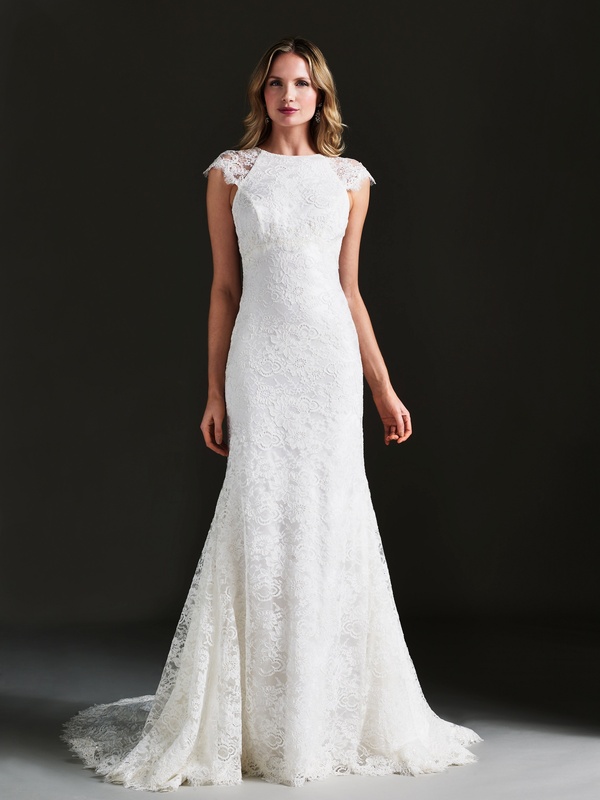 Choose a gown with embellishment on the bodice or a beautiful lace, falling in to a full or A-line skirt. Look for: Strapless, dresses with shape, waisted and fit and flare. Soft fishtail looks excellent on a tall bride. Wear a strapless gown to draw down the eye and give the optical illusion that you are not quite as tall but remember height is a wonderful thing and gives you loads of options with bridal gowns. Avoid: Boat necks and column gowns as these will simply make you look taller. Look for: Boat necks and column dresses. Designs that have high neck lines that make you look taller, the silhouette can be ball gown or fit and flare. Avoid: Strapless as this will give the illusion that you are shorter. 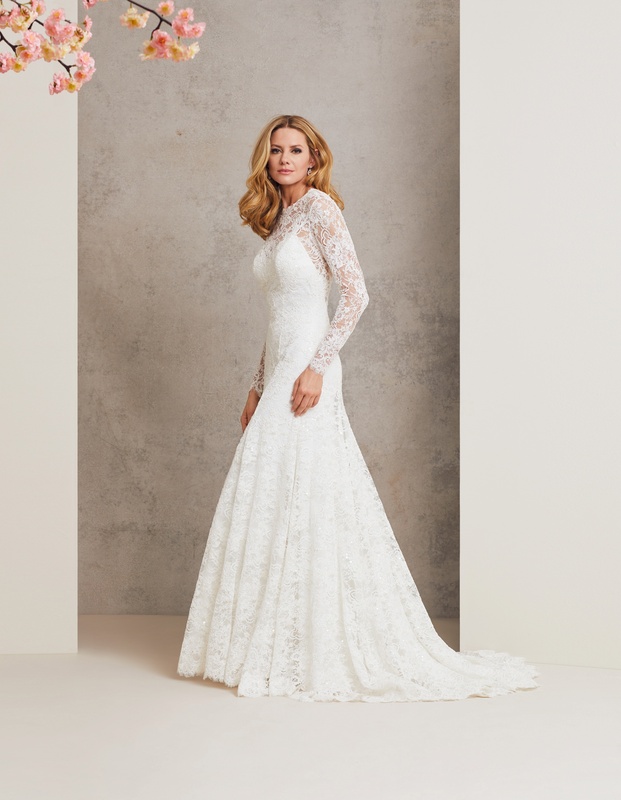 Brides with a smaller bust have more options when it comes to styles but need to make sure there is enough detail/style in the top half of the dress to balance out the small size of their upper body. Look for: Dresses with lots of upper body detail are much easier to wear with small bust and you even have the option of wearing backless dresses as less support is needed. Slender designs are really flattering but so are fuller skirts and ballgowns – small busted always looks good with a boat or crew neck bodice on a gown and this is really fashionable right now. Avoid: Sweetheart necklines and a strapless dress may not be the most flattering thing to wear if you have a smaller bust. An hourglass figure is similar to the pear body shape, however the shoulders and hips are perfectly balanced and the bust is more apparent. Brides with this body shape tend to have an extremely defined waist and very curvaceous assets. Look for: Dresses that are very fitted around your waist will look the most stunning and corsets will be fabulous on your figure. Opt for a sweetheart neckline, this is feminine and works well for keeping the bust and hips balanced. Wear a gown that accentuates your waist, this will show off your best asset, and understated but beautifully cut gowns will work really well on your figure and give you a powerful strong vision yet at the same time be understated. Big is beautiful! It is important to take into account your height when choosing your gown. Remember that you do not want to cover up, this is not flattering and does not ‘hide’ it emphasises rather than plays down. Look for a gown with a corset that will really create a beautiful silhouette and balance your figure while also helping your posture. Look for: Pick an A-line gown with a scoop or V-neckline to flatter the top part of your body and draw the eye upwards. V-neck lines are very flattering, A line skirts or a fit and very full flare skirt. Lace shrugs or lace bodices with delicate laces not heavy bold laces. Avoid: Completely covering an ample chest makes it look bigger, boat neck lines are a ‘no’. Don’t wear a heavy sleeve in a crepe or duchess satin, if you want to cover your arms choose a delicate lace where the skin tone shows through. 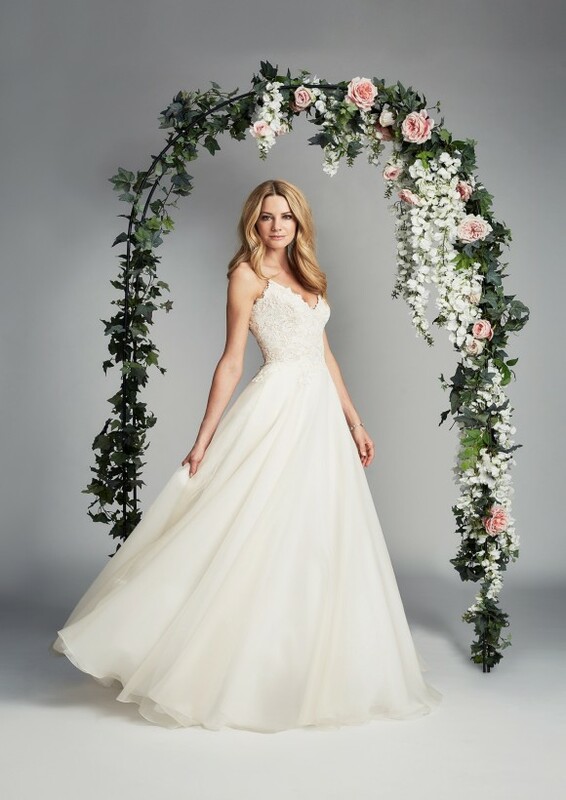 Selected Caroline Castigliano gowns are available at The Bridal Collection Harrogate and Kimberley Anne Bridal Boutique.